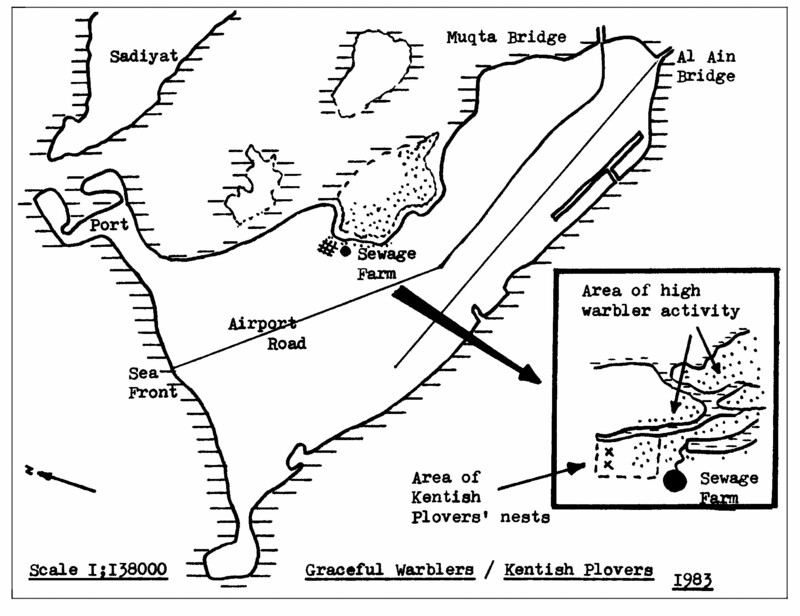 Bulletin 20 - July 1983: Observations of the Graceful Warbler, Kentish Plover and Sander's Little Tern in Abu Dhabi. Observations of the Graceful Warbler, Kentish Plover and Sander's Little Tern in Abu Dhabi. Once again it would seem to have been a successful year for the Graceful Warbler in spite of the encroachment of the Eastern Ring Road. One or two birds appear to have spent the winter in the breeding ground, a few arrived at the end of January and numbers increased through February, peaking out in mid-March. The last batch of young birds under observation flew on 22nd May 1983. 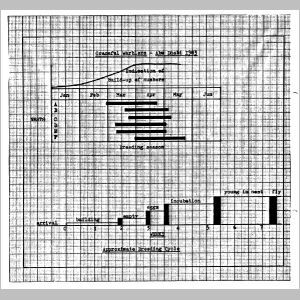 These notes cover the period of activity from February through May. The area that has been under observation is to the east of Abu Dhabi and just north of the original sewage farm. It consists of salt flats and scrubland which are subject to inundation at high tide. There is reason to believe that the breeding grounds possibly extend a considerable distance to the northeast and east of Abu Dhabi, thus making the area one of major importance. Sightings of this species have also been recorded seven miles north of the old airport, and two pairs have been seen in the grounds of the Hatta Fort Hotel, a further one hundred miles to the northeast. Graceful Warblers are small birds measuring between 4" and 5" from beak to the tip of the tail. The underside of the tail is marked with dark horizontal bars, not always easily visible at a casual glance. The two pairs seen at Hatta had decidedly more pronounced bars than the ones in Abu Dhabi, very easily seen by the naked eye. The colouring on the upper body is a mousy brown with faint streaks and the underside is much paler. In flight they seldom go very high above the tops of bushes and often fly close to the ground, or hop secretively in and out of vegetation. Sometimes a mature bird will put on a display by flapping its wings together, creating a repeated snapping sound. Owing to the relatively few nests (6) found it is not possible to decide categorically how much territory each breeding pair considers its own. However, what could well be territorial establishment rituals have been observed taking place on the ground, between pairs of birds on more than one occasion. It has been established that a bush never contains more than one nest and individual nests are not in close proximity. There seems to be no set pattern for selection of bush size, as some nests are only 18" off the ground while some are twice as high up. The bushes are all Arthrocnemum macrostachyum; on slightly higher ground there are a few low Suaeda vermiculata and grasses (Sporobolus spicatus, Cynodon dactylon and occasional Aeluropus massauensis) while Avicennia marina is numerous in the tidal creeks, but only A. macrostachyum provides sufficient dense cover. Fewer nests were found this year than last, not, it is felt, because there have been fewer birds but more likely due to the increase in foliage density. This is probably the result of two seasons of heavy rainfall in the winter and early spring of 1982 and 1983. Nests are difficult to find at the best of times and the increased foliage has compounded this difficulty. b) Perhaps a combination of a) plus the final touches to the nest interior. Constructed mainly of dry grasses interlaced with feathers, the nest provides a comfortable and well-hidden home. Internally, the bottom half is made of some as yet unidentified material which gives a felt-like finish, rusty in colour in the early stages but later fading to a neutral tone. This material, being only in the bottom half of the nest, probably adds strength and possibly provides some insulation. The top half of the nest is less tightly constructed with lightly interwoven feathers and grass. This could possibly be to permit any breezes to pass through for both cooling and ventilation. Oval in shape, the nests are approximately 7" from top to bottom, with the entrance about 1 1/2" in diameter at the upper part. Generally there are four eggs but occasionally only three, laid at the rate of one a day. No nest has been found with less than three or more than four. The eggs are difficult to see in the bottom of the nest and the only way to positively count them is by a very light touch of the fringes, checking of course that there are no young in the nest. The young are easily seen without the need to cause any undue disturbance. About fourteen days is the average incubation period and there are indications that the parent birds do sit on the eggs during this period. It is difficult to state how much time is actually spent on the nest because at the slightest hint of the approach of an outsider other birds give warning and the sitting bird leaves. Occasionally a parent bird will remain in the nest in the presence of a human, without any apparent fear. After hatching the young remain at the nest for about fourteen days before flying. During their early flight period the young can be recognised, before they reach maturity, by their larger beaks which are yellow, and their plumage which gives the impression of being in better condition. In some cases the undertail markings are slightly more pronounced than in the adult bird. From time to time it has been noticed that after the young have initially left, the top of the nest has either been completely removed or else a hole has been forced through the top. The tops of nests have not been removed or found holed while the young are in permanent residence. One possible reason is that the young could return at night to roost, and if the top wasn't removed or holed it would prove difficult for a group of large fledgelings to enter or leave the nest in a hurry. The diet consists mainly of insects and the occasional moth or small butterfly. 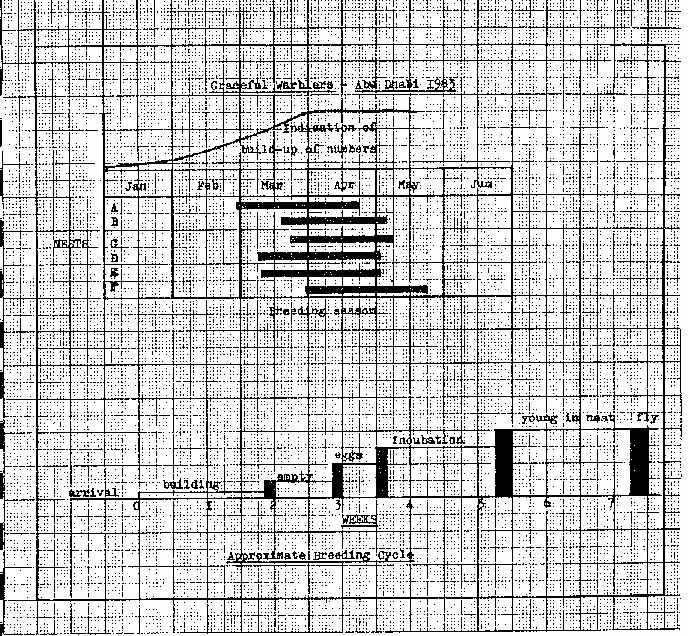 Timings given for building, incubation etc. are approximate because of the reluctance to continually disturb nests. However it is felt that in general accuracy is within a period of one or two days. With the progress of construction, the area that has been under observation this year is almost certain to be nonexistent next breeding season. There are still large areas of salt flats and scrublands to the north and east of Abu Dhabi, however, so the future of the Graceful Warbler should be assured for some time to come in the region. B. The Kentish Plover (0407) - Charadrius alexandrinus. The breeding season opened well this year for the Kentish Plover, with three nests being found against one in 1982. The first find was on 20th April, with three eggs in the nest which was just a shallow scoop on a small mound of sand with a few dead scrub twigs to one side. One egg has rolled a little way out of the nest so it was replaced, the other eggs being partially covered with sand. On 4th May, the nest was routinely checked and everything found to be correct. However, it was noticed that a bulldozer had been parked nearby. In the morning it had been carrying out grading operations adjacent to the new Eastern Ring Road to prepare the ground for backfilling. About an hour after this check the dozer was in operation again. Disaster. The eggs and nest had been obliterated. All was not lost, for the other two nests (discovered in the same vicinity on 23rd April), each with three eggs were out of the way of the advancing road. At least, so it was thought. On 6th May the eggs from one of these hatched and true to form the young walked off within twenty-four hours. Then with a clanking and puffs of black exhaust, the dreaded bulldozer began to devour more ground at an amazing pace, right in line with the final nest. The immediate forecast for this was, to say the least, one of despondency. But once again all was not lost. The driver was approached, shown the nest and the situation explained to him. Could he possibly drive around it? He would try. So the nest was very clearly marked. In the meantime the rest of the road gang, all Baluchis, had arrived, and they were duly briefed on the situation. One considered it would be a good idea to move the eggs there and then but was persuaded otherwise. International accord was arrived at for the local preservation of the Kentish Plover, at the price of a few glances through the binoculars, and the driver duly worked all round the nest. The feeling of wellbeing was short-lived. The backfilling of the graded area was proceeding at an alarming rate (25 - 30 metres per day) and this time there was no way that the nest could be avoided. It was felt that the construction company would not be receptive to being asked to build around the nest. So, with the road only 25 metres away, a drastic step was decided upon -to move the nest. There was now everything to gain and nothing to lose in the attempt. Within half an hour the move was deemed to have been successful as one of the parent birds was observed back at the nest. One day later, the backfilling had progressed past the nest site and the birds were still putting in an appearance. A happy ending is sought to all stories, this one being no exception. On the evening of 14th May the eggs were hatched and in the early morning of the 15th the young left the nest completely oblivious to all the efforts made on their behalf. The nesting season starts in early April and the laying and incubation period lasts from 23 -29 days. Normally three eggs are laid, occasionally four, as in the case of the nest found last year. Grey green in colour with black spots, the eggs themselves provide good camouflage. The eggs are partially covered with sand in many cases, but whether this is the results of wind or the birds themselves is hard to say. On close inspection the covering seems to be of too regular a nature to have been windblown and therefore it is possible that the parents do heap sand around the eggs. Once hatched, the young remain in the nest for less than a day. To stay any longer in one place would increase their vulnerability to predators. Domestic cats gone partially wild, and stray dogs seem to offer a threat, but in fact relatively few are seen. The young plumage, yellow with black spots, provides excellent camouflage for when approached they lie absolutely still, making it virtually impossible to pick them out from their surroundings. The nest is just a shallow scoop on the ground with no effort made at lining. Parent birds will try and attract the attention of any intruder away from the nest and young. They do this by putting on a vastly overacted display of being wounded, either by dragging a wing along the ground or fluttering around, also on the ground, apparently helpless. When the adults do leave the nest area, they run very quickly for a considerable distance before getting airborne. Judging by the amount of overacting put on by numerous plovers, it would indicate that Abu Dhabi could be part of a large breeding ground. The parent birds are in regular attendance at the nests during the day. Owing to the effectiveness of the early warning system given by other plovers, it has not been possible to see a parent actually sitting on the nest. Unfortunately, by next breeding season this area will be non-existent in terms of a breeding round for plovers. However, as it is only a small part of what seems to be a much larger area there should be no threat to the population in the foreseeable future. It is known that these terns breed in this area and on some of the offshore islands. Due to the inaccessibility of the majority of these areas it is difficult to give an idea of the numbers involved, but they are numerous. 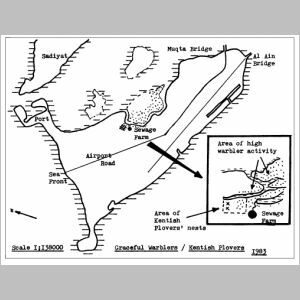 Fortunately it was possible to make a few visits to a small island in a creek about seven nautical miles north of the old airport but owing to the infrequency of these visits continuous and detailed records could not be made. It was established that the island was supporting a small breeding colony of these terns. Three nests were found, each containing two eggs, which is the norm. The nests were hollows in the ground, very basic, with no lining and no effort to camouflage but still very difficult to find. Initial indications that breeding might be taking place were given by two adult birds, having been disturbed, flying in an orbit around the island. During a moment when one of them felt less threatened it alighted on the ground for about a minute and then flew off again. A very thorough search was carried out in the immediate landing area and the reward came when a nest was discovered, complete with two eggs. The same tactics over a number of visits resulted in the finding of two other nests. It appears that one of the parents always remains at the nest during the day, while the other is away, possibly ,fishing. In fact one did arrive at the island carrying a small fish in its beak. On one of the last' visits there were five separate adult birds flying around; three were accounted for and two newcomers were trying to land in different areas from the other nests. It is therefore possible that the island was supporting more than the three confirmed pairs of nesting birds. A subsequent visit much later established that the Sander's Little Terns had all left, their place being taken by Bridled Terns. Unfortunately, lack of time prevented a search being carried out for nests.